Johan Izaak de Borst, founder of the FEBO chain of restaurants, died "in all peacefulness" on May 8, aged 88. 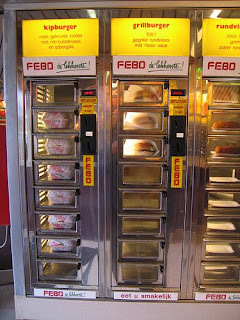 FEBO, for the uninitiated, is famous for its coin-operated food vending machines. You call such a contraption an 'automat' in English, 'automatiek' in Dutch. In the U.S. they summon up images of Coney Island in the 1950s. But even today you can run out just about any time of the day or night in Amsterdam and get a croquette or burger _ make that "burger," with meat of indeterminate origin _ for just 2 euros. Well, maybe it's safer just to say "inspired by" meat. I think that for most of us, it's safe to say FEBO's slogan "De Lekkerste," or "The Tastiest" is always read with a touch of irony. Even when it crops up in everyday speech. No one gave a damn about food automats until they opened one back up in NYC last year, and suddenly the world realized that Holland has held on to this awesome relic. At the same time, the Febo has a certain majesty and tradtion to it. Who can honestly say that he's never scarfed down a few FEBO snacks at 3 in the morning while absolutely plastered? Maybe I haven't done so lately, but still. 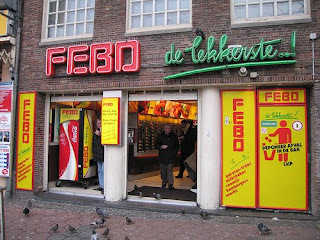 A little insider trivia: the name FEBO is taken from "FErdinand BOl" the famed street market that forms the beating heart of my neighborhood. The first maison FEBO was opened here in 1941. Germans or no Germans. GeenStijl has called for a moment of silence tomorrow at 1 p.m., which I'll try to observe. Gaan we volgend weekend dan ff n speciaaltje busten?